Everyone was thinking about what could happen instead of talking about what would happen. Peterborough Speedway’s Autumn Colours Classic had the OSCAAR Super Late Models as part of the show and it was the final point paying event on this year’s tour. The season championship had pretty much been decided, but there were a number of positions that were still up for grabs throughout the field. Even though they weren’t scheduled to qualify until the next day, the OSCAAR Super Late Models ran a couple of practice sessions Friday afternoon on the venue known as Canada’s Toughest 3rd of a Mile Paved Oval. Any concerns Mike Beyore might have had about changing track or weather conditions were quickly moved to the back burner by the confidence the second generation Whitby, Ontario veteran racer felt about his machine’s performance during the opening round. During the second qualifying heat Saturday afternoon, ‘The Whitby Warrior’ took the green flag from 5th spot and wound-up finishing 2nd. Still feeling great about the weekend’s effort, the #54 ride lined-up 3rd in the 5th qualifier and again managed a 2nd place showing. With a pair of solid runner-up efforts to build on, there was time to relax and enjoy some racing with the other divisions before loading the car into the hauler for the night. Even when he was sent to the back of the pack following an opening lap incident, Beyore remained positive and did his best to settle into a rhythm, while pushing his machine to its limit in an effort to get back to the front of field. On most tracks, 50 lap main events will give a driver plenty of time to plan a strategy, but the lap counter at Peterborough clicks things off in a hurry. When all was said and done, Beyore crossed the line in 4th spot. It wasn’t a checkered flag or even a podium finish, but everyone on the team was happy with the result. In the pits: The #54 OSCAAR Super Late Model team finished the 2014 season 6th in the final point standings…Max Beyore managed a 2nd place effort in the OSCAAR Modified finale. 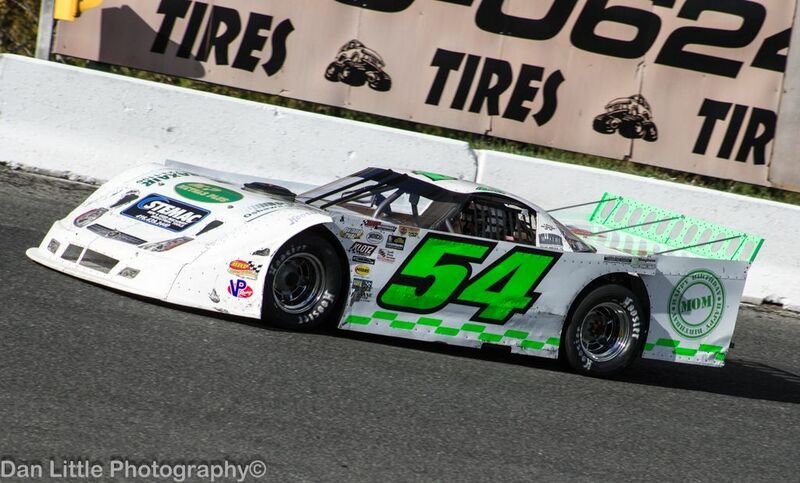 He was also 2nd in the point standings and was named the division’s Rookie of the Year. Follow Mike Beyore on Twitter via @54buck and at www.beyoreracing.ca. Mike Beyore's 2014 OSCAAR Super Late Model tour was supported by Stemac Machinery & Industrial Tools, Millennium Crane, Metals Plus, CNC Custom Machining, Praxair, MGS Performance, Mayhew Graphics, Vista Engineering Corporation and Lesco Industrial Restoration, with promotional services by Clarke Motorsports Communications. 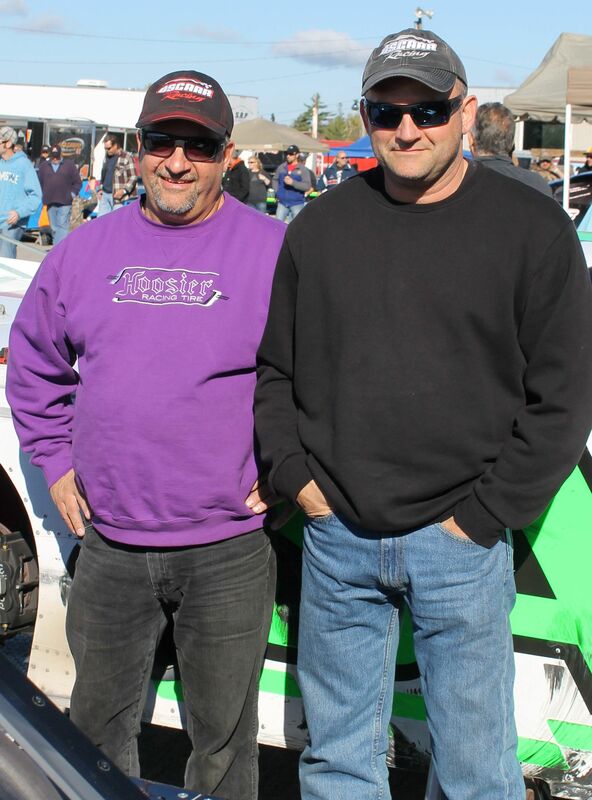 Mike (L) and Max Beyore enjoy a little down-time prior to the OSCAAR Super Late Model and Modified main events – Sunday, October 12th – at Peterborough Speedway.